Maria Echaveste is a lecturer in residence at Boalt Hall at the University of California, Berkeley. She is married to Chris Edley, Jr. Following graduation from Boalt, Echaveste specialized in corporate litigation at the former Los Angeles firm Wyman Bautzer and at Rosenman & Colin in New York. After leaving the White House, she founded the Nueva Vista Group, a consulting firm based in Washington, D.C., that works with nonprofit organizations, associations and corporations on such issues as immigration, health care, telecommunications, labor and finances. In 1974 Boo Bacon, Chris Baron, Maria Echaveste and Jack Handy were candidates for ASSU Council of Presidents. Our candidacy is based on the belief that the ASSU Council of Presidents should not restrict its activities to the area of student services but should also deal with student involvement in educational and social change, and that the Council should be responsive to the interests of all students, including women, minority, and graduate students. Chris Baron's experience as chairwoman of the SWOPSI Board gives her the insight necessary to deal effectively with these issues. As a Daily editorial stated, "her work on the SWOPSI Policy Board has been especially valuable in keeping that important program going." Curriculum Gaps We propose to establish, in conjunction with SCIRE, a Task Force on Curriculum to deal with the need for alternative introductory courses and curriculum gaps. We support NorCal PIRG's (Public Interest Research Group) effort to provide students with valuable information on consumer issues while engaging them in meaningful research. Jack Handy has been Chairman of NorCal PIRG and will work to develop the program to its full potential at Stanford. We have been attacked for representing "special interests" because of our concern for minority affairs. We believe, however, that all students benefit from a culturally, ethnically and sexually diverse university and that the university and its students should be committed to racial and sexual equality.Boo Bacon as editor of The Real News and Maria Echaveste as co-chairwoman of MEChA have actively pursued these goals. Both have also been active in the ASSU Senate, with Maria serving as vice-chairwoman . May 1975, Several groups are planning an alternate commencement ceremony on graduation day as a protest against commencement speaker Daniel Patrick Moynihan. Currently a Harvard professor of government, Moynihan has attracted criticism from some campus groups over alleged poor scholarship in his works on the problems of black Americans. Charles Ogletree, graduate student in political science and former ASSU vice president, said alternate commencement will be on Sunday, June 15. Ogletree said "its main purpose will be to provide an alternate ceremony for black seniors, black parents and [all J those receiving M.A. 's and Ph.D.'s." Ogletree stressed that the special ceremony is "open to any graduating student who doesn't want to attend the University's commencement." MEChA spokeswoman Maria Echaveste said chicano faculty, staff and students passed a resolution in early April supporting the black students. "We felt that inviting Moynihan to give the commencement speech was a serious insult." Echaveste said that "we will help them in any way the blacks see fit." * "We do support the black community," said Sharon Malotte, spokeswoman for the Stanford American Indian Organization, but Malotte did not know of the alternate commencement proposal. "We will help in a campaign if asked," she said. Friday the Stanford Asian Students Coordinating Committee (SASCC) voted in favor of a position paper opposing Moynihan's speaking at graduation. The paper stated that "Moynihan's selection is the latest episode in this administration's callous regard for ethnics of color. The action is not only an insult to the sensibilities of ethnic parents and students, but an exercise in abuse on the part of the University's public relations machine." SASCC stated that it regards "the Moynihan invitation as an indication of Stanford's waning commitment to all ethnics of color," and has urged "concerned members of the Stanford community to boycott the commencement exercises at which Moynihan will speak." May 13 1975, about 350 demonstrators sat in the lobby of the Old Union for over an hour, protesting a University research contract with Iran and changes in financial aid programs for minority students. About 150 of the protestors, including many Iranians, chanted and marched in a picket line outside the building. They later joined the others in the lobby. Inside the building, the relaxed crowd sang protest songs, listened to speeches, and cheered at the arrival of a "lemonade brigade." Earlier, at least 600 persons, mostly students, marched across White Plaza and rallied outside the Center for Research and Development in Teaching (SCRDT), in which the Board of Trustees was holding its monthly meeting. Co-Sponsors The protest was co-sponsored by three groups: the Alliance for Radical Change (ARC), the Iranian Students Association (ISA) and the Revolutionary Student Brigade (RSB). Other campus groups, including Students for Equity, endorsed the rally. Through University officials ARC issued a statement asking the trustees to terminate a three-year, $1 million contract to develop a satellite system for National Iranian Radio Television, and to restore "cuts made in minority student financial aid." The demands were presented to the trustees' Committee on Academic Affairs by President Richard Lyman. The trustees asked Lyman some questions about the issues but took no action, said Robert Rosenzweig, vice president for public affairs. Rosenzweig said the trustees probably did not discuss student demands or the protest at their afternoon meeting "because it wasn't on their agenda." No Response The trustees' failure to respond to the demands influenced the decision to march on the Old Union, an ARC source said. A "Tactical Committee" apparently planned and directed the demonstration. "The Committee is made up of three people from ARC and two people from each of the other [co-sponsoring) groups," the ARC source said. Seth Foldy, an undergraduate who functioned as the Tactical Committee's press secretary, said its official policy was "to avoid confrontation with police and to avoid arrests." Various factors, including the size and composition of the crowd, influenced the Tactical Committee's decisions about which of several contingency plans to use, the ARC source said. ASSU Sen. Maria Echaveste of Students for Equity said, "The organizers of the rally put the financial aids issue on the bottom. The Iran contract was the main issue." However, another speaker, Michael Kieschnick of ARC, said the issues are related because both show the University's interest in "education for profits, not for people." At 1 p.m. the crowd formed a column and marched in the direction of the SCRDT building. They were met by 120 Iranian students from Southern California and San Jose, in the middle of a march from Los Angeles to San Francisco to protest the Shah's upcoming visit to the U.S. Members of the ASSU Council of Presidents escorted some trustees to the building. "The Council of Presidents took no part in planning the demonstration," Foldy said. Once all the trustees had entered the building, the marchers convened on a nearby lawn, where speakers read prepared statements and compard the Stanford protest to others around the nation. On The Move At about 2 p.m. ARC member Jan Jacobson instructed the crowd to "stay together and march through the campus." Minutes later, the crowd reached the Old Union Courtyard. Information and transcript windows were closed when protestors entered the Old Union lobby. "I believe it was Bob Houghton's decision based on normal procedure when large numbers of people enter the building," Registrar Sally Mahoney said. Houghton, the associate registrar, said it was Mahoney's decision. Mahoney said the protest "has shut us down, at least for now." But business as usual prevailed on the upper floors of the building, observers said. Rosenzweig, standing with other administrators in the doorway, said he did not consider the protest a "sit-in" because the building was still open for business. 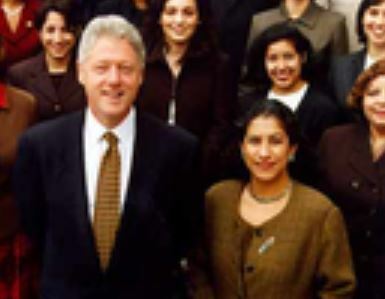 From 1998 to 2001, Maria Echaveste served as assistant to the president and deputy chief of staff to President Bill Clinton. In this capacity, Echaveste managed domestic policy initiatives that focused on education, civil rights, immigration and bankruptcy reform. She also developed communications, legislative and public outreach strategies. In another area, she coordinated relief efforts within the White House for foreign and domestic disasters, and specialized in international issues related to Latin America. She was previously the administrator of the labor department's Wage and Hour Division from 1993 to 1997. In 2005 Maria Echaveste served as a fellow of Center for American Progress. In 2009 Maria Echaveste was listed as a member of the Board of Directors of The American Prospect. Endorsers of the proposal included Maria Echaveste. PowerPAC+ Board of Directors, as of 2014 included Maria Echaveste - Berkeley, CA Co-Founder of Nueva Vista Group, LLC. Had a great event last night for Lucy Flores's campaign for Nevada Lt. Gov. And with special guests CA Lt. Gov. Gavin Newsom and Obama's nominee for Ambassador to Mexico, Maria Echaveste! — with Yukiya Jerry Waki, Laura Brady, Johanna Silva Waki, Andrea Dew Steele, Amy Chen and Crystal Zermeno. Steve Phillips November 29, 2015. Doing the hip Berkeley thing with movers and shakers Maria Echaveste and (Obama prof) Chris Edley — eating brunch at Zut! On Fourth. Inclusv Advisory Board members, as of May 12, 2018 included Maria Echaveste. This page was last modified on 1 January 2019, at 20:16.